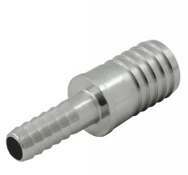 Used for permanently or temporarily joining hose of the same and different ID's. Tee for splitting and adding lines. Stainless Steel Barb ''T'' splicer. For 1/4 ID hose. Stainless Steel Barb ''T'' splicer. For 3/8'' ID hose. Stainless Steel Hose splicer. For 3/16 ID hose. Stainless Steel Hose splicer. For 1/4 ID hose. Stainless Steel Hose splicer. For splicing 3/8''ID hose to 1/4''ID hose. Hose splicer. For 3/8 ID hose. Hose splicer. For 5/16" ID hose.